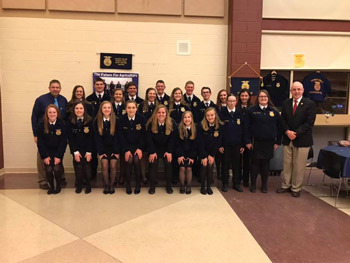 It was such a distinct pleasure to attend the 12th annual FFA dinner at Annville Cleona high school - Home of the Little Dutchman Chapter. Our nation is in great hands with these great young leaders! 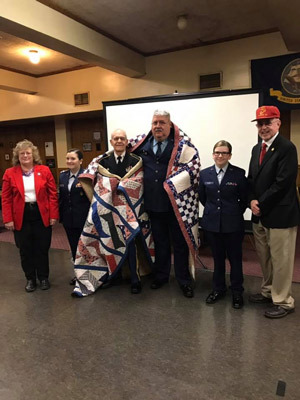 You can’t have a better night then when you get to present and be part of the ceremony with the Civil Air Patrol honoring their graduates of the cyber security program and the Quilt of Valor presentation which honored Don Stoudt Sr. and Don Stoudt II. God bless them all! 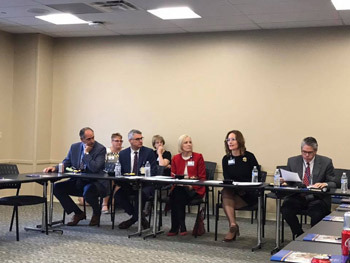 I attended the April 2, North Cornwall Township supervisors meeting. We had a great discussion about the items of interest in Harrisburg. Tremendous work done by the supervisors Mike Wahmann, Mike Deitzler and Sam Abram. Kudos to Tom Long, solicitor Amy Leonard and township engineer Steve Sherk of Steckbeck Engineering. I fielded questions and provided an update about the state budget, EMS and fire, and DEP-related issues. I attend as many township and school board meetings as my schedule will allow. We can't complain about government if we don't participate! This week, the House today passed legislation I authored that would equalize the pay received by members of the Pennsylvania National Guard to that which is received by their U.S. Army counterparts. My bill would require that pay for deputy adjutant generals and general officers in command positions permanently employed by the Commonwealth are to be equivalent to the federal military base pay. In addition to specifying the eligibility requirements and conditions for the pay increase, this measure also determines how the cost-of-living adjustment is to be calculated. his legislation is important because the Pennsylvania National Guard adjutant general and uniformed deputy adjutant generals earn significantly less than their active duty counterparts though they maintain the same military standards and comparable senior executive responsibilities. As a matter of fact, they can earn less than other soldiers two to three ranks their junior – depending on time in service. The House this week passed my resolution requesting the governor and the secretary of revenue to enter into negotiations with the State of New York to create a tax reciprocity agreement between our two states. Currently, Pennsylvania has income tax reciprocity with six other states. These agreements allow Pennsylvania residents who work in a reciprocal agreement state to remain subject to the Pennsylvania state income tax on employee compensation and for out-of-state workers to remain subject to the income tax rate of their home state. Establishing income tax reciprocity with the state of New York would be beneficial to Pennsylvanian’s for two main reasons, the first being that Pennsylvania has a lower state income tax than New York. Pennsylvania’s current income tax is a flat rate of 3.07 percent while New York’s income tax ranges between 4 percent and 8.82 percent. Therefore, income tax reciprocity would allow Pennsylvania residents working in New York to pay a lower percentage of income tax. Secondly, based on figures provided by the Department of Revenue, there are approximately 17,500 New York resident-commuters who remit state income tax to Pennsylvania, while 42,400 Pennsylvania resident-commuters remit state income tax to New York. It is estimated that a reciprocal agreement could result in a net gain of income tax revenues for the Commonwealth of over $60 million. I have heard from some of you who want an update on my efforts to eliminate property taxes in Pennsylvania. There have been discussions about eliminating property taxes for decades. elimination of property taxes. With that amendment, it would only be necessary for legislation to be enacted to rid the Commonwealth of this regressive tax. The tricky part is the replacement tax. This week in the House we passed legislation known as Marsy’s Law, of which I am a co-sponsor. The measure is named for Marsalee (Marsy) Nicholas, a California college student who was shot and killed by her ex-boyfriend in 1983. Only a week after her murder, Marsy’s brother and mother walked into a grocery store and were confronted by the accused murderer, whom the family had no idea had been released on bail. • Protection from the accused and notice of release or escape. • Full and timely restitution and proceedings free from delays and with prompt conclusion. In an effort to reduce mosquito breeding, there will be a tire collection for county residents at the Lebanon Expo Center, 80 Rocherty Road, Weds., April 17, from 8 a.m. to 6 p.m. Please bring proof of address- driver’s license, phone bill, etc. Out-of-county persons or tire related businesses will have to pay for all tires they dispose of at the collection. • 12 auto or 2 large (or a mix of 1 large and up to 6 auto) tires can be collected for free, so long as funds are available in an individual’s municipality. Individuals will be charged after municipality funds are depleted. • Excess tires or tires from municipalities that are out of funds, will be accepted at $3.00 per auto tire and $25 per large tire (large tire being defined as having a rim diameter of 25 inches or greater). • Tires must be off the rim, drained of water, unburned, and not excessively dirty. • PLEASE NOTE THAT FUNDS ARE LIMITED. Ask your regular trash collector/recycler if they accept tires. Some may accept a small number per week or month. Deadline for Pre-Registration is Weds., April 3. Pre-registrants will have reduced wait time and can drop-off at their convenience. Pre-registration will be done on a first-come, first-served basis and is dependent upon availability of funds at the time of registration. Email registration is strongly preferred and will reach the pre-registered list first. This Saturday, April 13, marks the statewide opening day of trout season. Fishing begins at 8 a.m.
To participate, anglers ages 16 and older must have a valid Pennsylvania Fishing License and a Trout/Salmon Permit, both available at gonefishingpa.com or at more than 700 issuing agents. Multi-year licenses are also available in 3-year, 5-year and 10-year increments. Prices for licenses and permits remain the same as last year. Youth anglers ages 15 and under do not require licenses or permits. To locate stocked trout fishing waters near you, select the 2019 Trout Stocking Schedule at fishandboat.com. Waterways on this list are searchable by county, organized in alphabetical order and provide the date, time and meeting place for each stocking event. The FREE Fish Boat PA Mobile App is the most useful tool in an angler’s tackle box. Download the app from the Apple App or Google Play stores to locate stocked waterways or wild trout streams, use the fish identification tool, and view fishing and boating regulations.